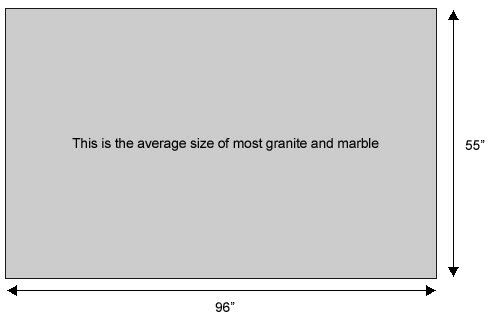 How to Measure Kitchen Countertops! * To start, be sure to measure from wall to wall. Don’t just measure your old counter. * Make a simple diagram of the counter layout and transfer your measurements to it. * Measure twice–-you know the adage, “Measure twice, cut once." 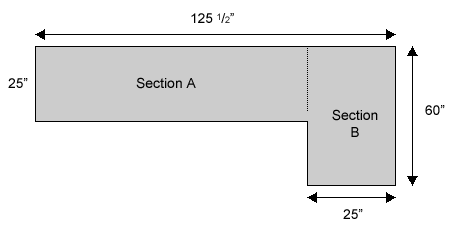 * If your countertop angles at 90 degrees, you’ll have to take measurements from both directions to the meeting point. If you decide to replace your kitchen sink along with the countertop, it’s important to have the new sink there when measurements are taken. Sinks come in various sizes, and you’ll want to be sure it can work with your new look. If the wrong size hole is cut into your counter, it is destroyed and that large section will need to be replaced. 100” x 25” = 2500 sq. in. 60” x 25 ” = 1500 sq. in. 72” x 30” = 2160 sq. in. 54” x 30” = 1620 sq. in. 15.0 + 11.25 = 26.25 sq. ft. / The total counter top is 26 ¼” sq. ft.
75” x 36” = 2700 sq. in. If you would like to get in contact with Granite & Marble Direct LLC, you have a number of options. You can call or mail us, our team will support you as soon as possible.